Home » Giant » offline contest » purchase » qna » spend » vouchers » Sep8-Oct19: Giant 72nd Anniversary Celebration Peraduan Kira & Menang Contest: Win Shopping Voucher for 1 Whole Year! 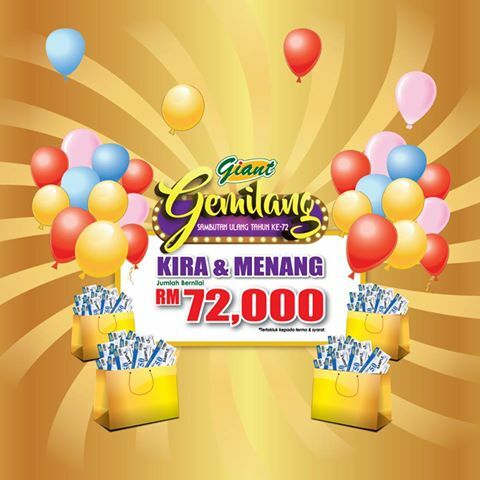 Sep8-Oct19: Giant 72nd Anniversary Celebration Peraduan Kira & Menang Contest: Win Shopping Voucher for 1 Whole Year! Spend a minimum of RM72 and above in a single receipt at any Giant outlet. Answer 2 simple question, count how many Giant gemilang logo in the contest form and complete your personal details. Attach your receipt together with your Contest Form and submit it to the Contest Box located at the Customer Service counter. Visit Peraduan Kira & Menang contest page for more details.